A few days ago, we ran our mega-list of over 323 comic book creators doing signings on Free Comic Book Day tomorrow. But there’s always room for a few more. 43 more. Such as Dr. No’s Comics & Games SuperStore of Marietta, Georgia, holding a virtual “comic con in a comic shop” from 11 a.m.-8 p.m. including Mark Bagley, Julie Hadden Barclay, Peter Cutler, Les Dabel, Kristina Deak-Linsner, Michael Gordon, Van Jensen, Joseph Michael Linsner, Dean Motter, Jorge Santiago Jr. and Wayne Vansant. Comics, Cards & Collectibles of Maryland, Baltimore, will have Frank Cho, Christine Larsen signing from 1pm-4pm, Ryan Parrott, Filip Sablik, Morgan Perry, S.A. Check, S.L. Gallant, James Kuhoric, Steve Conley and John Gallagher. Sleeping Giant in Tonawanda, New York, will have Jim Starlin signing. 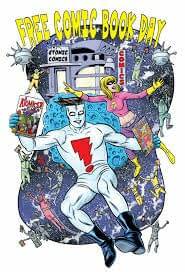 Third Eye Comics in Annapolis, Maryland will have Gerry Duggan and Mike Hawthorne signing. Dewey’s Comic City with Andre Szymanowicz, Sian Mandrake, Tom Mandrake, Damien Dimitri Torres, Josh James, Mark McKenna, JP Buzio, Giovanni Valletta, Alexia Veldhuisen, Nick Justus, Buddy Scalera, Justin Prokowich, Jan Duursema and Fabio Redivo. Four Color Fantasies in Winchester, VA will have Justin Jordan, Ally Cat, Nikki Ryan, and Hobbes Hollick signing. Toys Time Forgot in Canal Fulton, Ohio, will have Tony Isabella signing.